Whether you have come to pray, to search or to ponder; whether you are a lover of art, architecture or music; whether you need help or have come to look round, you are most welcome here. 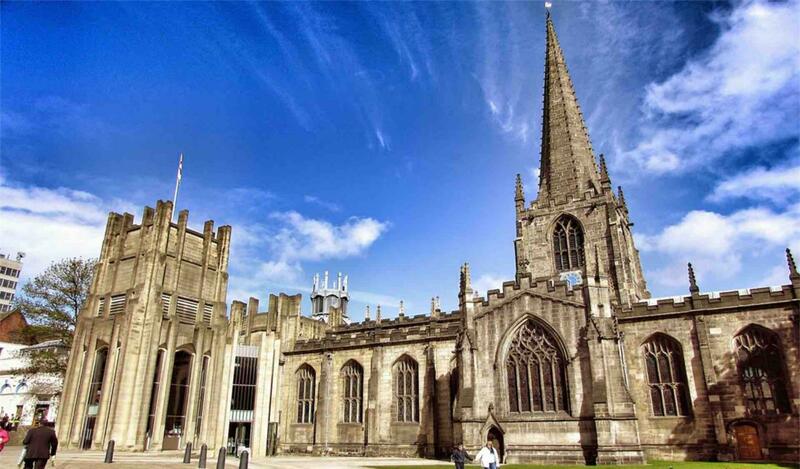 Come to one of Sheffield’s oldest buildings, the ancient heart of this great city. Stones from a Norman church (11th – 12th century) with their dog-tooth pattern, can be seen set in the east wall. The Tudor monuments in the Shrewsbury Chapel are magnificent, especially the one commemorating the 6th Earl of Shrewsbury, husband of Bess of Hardwick and guardian of Mary Queen of Scots during her fourteen years of imprisonment in Sheffield. Every window tells a story, not least the Lantern window in the west end which welcomes you in to this place. The Church Burgesses gave the Resource Centre its opening feature, the 1554 Gallery. Its glass doors have an etched design featuring the crest of the Burgesses with the date 1554 and the appropriate words ‘Sigillum Villa de Sheffelde’. Regular worship and ceremonies take place at the Cathedral. Access may be restricted at these times. M1 J33/34. Follow signs for Sheffield City Centre. Follow brown signs for the Cathedral. Limited parking nearby. For detailed directions please check the cathedral website. Accessible by Public Transport: Sheffield station is 1 mile away. May charge for some activities and events.